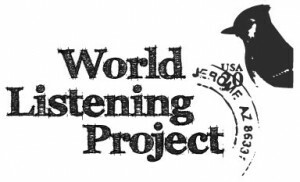 THE WORLD LISTENING PROJECT (WLP) is a 501c3 tax-exempt not-for-profit organization devoted to understanding the world and its natural environment, societies and cultures through the practices of listening and field recording. WLP was founded in 2008 and is supported by the Midwest Society for Acoustic Ecology, the regional chapter of the American Society for Acoustic Ecology, a membership organization affiliated with the World Forum for Acoustic Ecology. The WLP maintains a website and online forum about its artistic and educational activities. These include the use of radio and web-based technologies, conducting public workshops, forums, lectures, as well as participating in exhibitions, symposia, and festivals. To learn more and be involved in the WLP’s activities please www.worldlisteningproject.org and subscribe to our discussion group.